Nationalism and socialism were rife in China in the 1920's, this led to the rise of Communism and the formation of "The People's Republic Of China"
Mao Zedong ( ), who had become a Marxist at the time of the emergence of the May Fourth Movement (he was working as a librarian at Beijing University), had boundless faith in the revolutionary potential of the peasantry. He advocated that revolution in China focus on them rather than on the urban proletariat, as prescribed by orthodox Marxist-Leninist theoreticians. 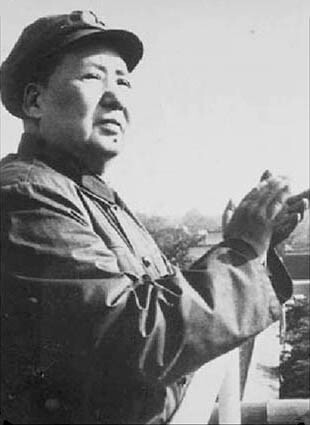 Despite the failure of the Autumn Harvest Uprising of 1927, Mao continued to work among the peasants of Hunan Province. Without waiting for the sanction of the CCP center, then in Shanghai, he began establishing peasant-based soviets (Communist-run local governments) along the border between Hunan and Jiangxi ( ) provinces. In collaboration with military commander Zhu De ( 1886-1976), Mao turned the local peasants into a politicized guerrilla force. By the winter of 1927-28, the combined "peasants' and workers'" army had some 10,000 troops. Mao's prestige rose steadily after the failure of the Comintern-directed urban insurrections. In late 1931 he was able to proclaim the establishment of the Chinese Soviet Republic under his chairmanship in Ruijin Jiangxi Province. The Soviet-oriented CCP Political Bureau came to Ruijin at Mao's invitation with the intent of dismantling his apparatus. But, although he had yet to gain membership in the Political Bureau, Mao dominated the proceedings. In the early 1930s, amid continued Political Bureau opposition to his military and agrarian policies and the deadly annihilation campaigns being waged against the Red Army by Chiang Kai-shek's forces, Mao's control of the Chinese Communist movement increased. The epic Long March of his Red Army and its supporters, which began in October 1934, would ensure his place in history. Forced to evacuate their camps and homes, Communist soldiers and government and party leaders and functionaries numbering about 100,000 (including only 35 women, the spouses of high leaders) set out on a circuitous retreat of some 12,500 kilometers through 11 provinces, 18 mountain ranges, and 24 rivers in southwest and northwest China. During the Long March, Mao finally gained unchallenged command of the CCP, ousting his rivals and reasserting guerrilla strategy. As a final destination, he selected southern Shaanxi ( ) Province, where some 8,000 survivors of the original group from Jiangxi Province (joined by some 22,000 from other areas) arrived in October 1935. The Communists set up their headquarters at Yan'an ( ), where the movement would grow rapidly for the next ten years. Contributing to this growth would be a combination of internal and external circumstances, of which aggression by the Japanese was perhaps the most significant. Conflict with Japan, which would continue from the 1930s to the end of World War II, was the other force (besides the Communists themselves) that would undermine the Nationalist government. China has recently celebrated 50years of a succesfull communist government. Some see Mao-tse-tung as a visionary and liberator of China. All reactionaries are paper tigers. Communism is not love. Communism is a hammer which we use to crush the enemy. Despise the enemy strategically, but take him seriously tactically. In waking a tiger, use a long stick. Let a hundred flowers bloom, let a hundred schools of thought contend. Once all struggle is grasped, miracles are possible. Passivity is fatal to us. Our goal is to make the enemy passive. Revolution is not a dinner party, not an essay, nor a painting, nor a piece of embroidery; it cannot be advanced softly, gradually, carefully, considerately, respectfully, politely, plainly and modestly. Take the ideas of the masses (scattered and unsystematic ideas) and concentrate them (through study turn them into concentrated and systematic ideas), then go to the masses and propagate and explain these ideas until the masses embrace them as their own.